Adding a new building in such a small space between three existing (and architectonically different) buildings could easily lead into an unclear urban ensemble. In our opinion The VerbindungsTrakt is a big obstacle in order to succeed with the extension of the Faculty. It does solve the difference in height between the two volumes but it does not establish a convincing link between the two buildings from an urban point of view. We therefore consider the removal of this element. 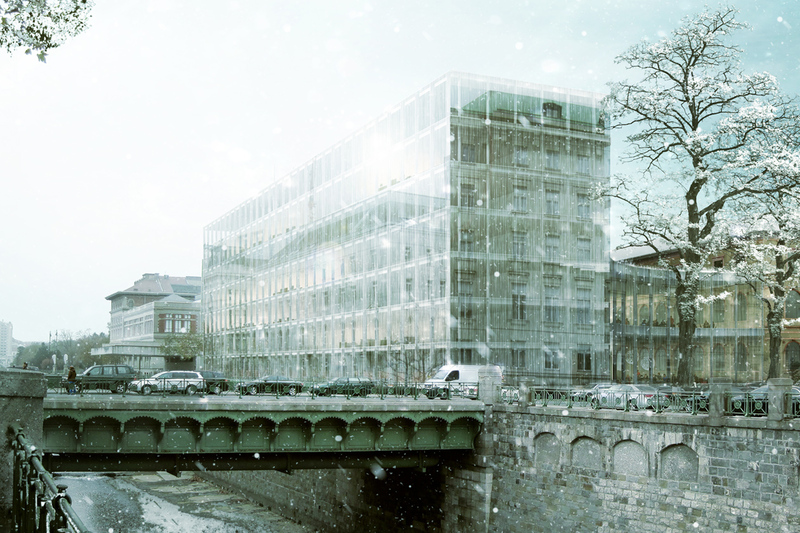 Our proposal merges the Schwanzer-Trakt and the new extension into one new building, what we called the “Iceberg”. The Iceberg preserves the shape of the Schwanzer-Trakt towards the Promenade and has a sculptural shape towards the inner courtyard. This curved shape relates mainly to a sunlight study. This study implies that we try to ensure the best sun orientation and where possible keeping enough space for the inner garden. A more straight design (as per the building regulations) would end up in a very narrow and deep garden which will no longer keep any of the current garden qualities.